Background: Chemists have been interested in light as an energy source to induce chemical reactions since the beginning of scientific chemistry. The organic photochemical reactions do not require toxic or polluting reagents so these reactions presented perspectives in the context of green chemistry and sustainable processes. Objective: The largest classical divisions of organic chemistry are constituted by heterocycles. The role of heterocyclic compounds in a number of areas cannot be ignored. That's why the chemists are continuously trying to design and synthesize heterocycles. This review summarizes the chemistry of photochemical reactions with emphasis on their synthetic applications. 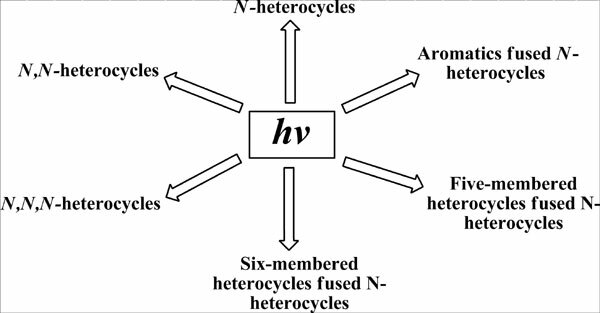 In this review, the most important photochemical transformations that have been employed in six-membered N-heterocycles synthesis are presented. Conclusion: This review discussed the research activities in organic photochemistry that are applicable in organic synthesis. This review outlined the synthesis of heterocyclic compounds. Traditional approaches require highly specialized or expensive equipment, are highly inconvenient, or would be of limited use to the synthetic organic chemist. Therefore, these have been omitted by them. Photochemistry can be used to prepare a number of heterocycles selectively, efficiently and in high yield. Heterocycles, nitrogen, photochemical, synthesis, six-membered rings, irradiation.